Dates and goat’s cheese, a classic Middle Eastern combination that works as an appetizer, nosh, or dessert. Stately date palms grace many streets in the Middle East, giving the landscape an unforgettable silhouette. In Israel, municipalities prune their date palms and give out the big, rustling leaves gratis to those who like to roof their succot with them. Many families decorate their succah with an entire bunch of fresh yellow dates. And for easy recipes appropriate to Succot, try the combination of moist Medjool dates with a chunk of salty goats cheese, preferably one with blue veins running though it. Remove the pit from each date. Arrange each chunk of cheese on a plate and place one date on top. Stuff about a teaspoon of cheese into each of the other dates. Place them attractively around the cheese. Drizzle the silan/oil mixture over the cheese and date. Drizzle a little more over each date on the side. Lightly oil a baking dish just large enough to hold the dates in a single layer. Using a small knife, make a small lengthwise incision in each date. Carefully remove the pits. Stuff 1 tsp. of the goat cheese into the cavity left by each date’s pit. Arrange the dates, with the goat cheese side facing up, in the prepared dish. 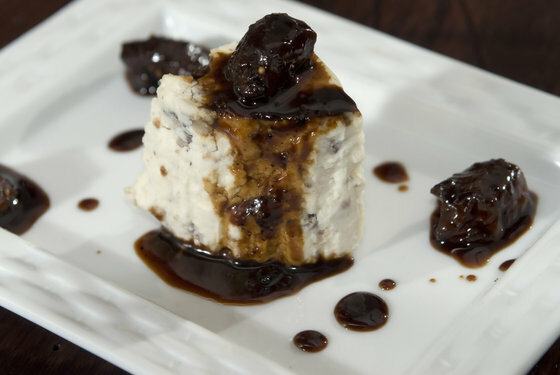 Image of goat’s cheese and dates via shutterstock. Oh no, why did you put this up! I’d have never thought of putting these together and now it is all I can think about – grin. What a combination – thanks!